The idea of the sharing economy has been getting a lot of press these days, with some hailing the rise of collaborative consumption as a more sustainable model than the current one, where everyone needs to own one of everything, and some decrying the term sharing economy as being nothing of the sort. The phrases that get associated with the concept of the sharing economy are certainly a bit muddy, but at its core, the idea of enabling people to get access to the things they need, which other people have and are willing to rent or swap or share, can serve to change how we consume, own, or produce the goods or services we desire. There’s a new free platform that can serve to help move the sharing economy forward, by offering an open market for people to list and claim goods or services that are available to rent, swap, sell, or share. Open Marq, which is still in beta, features an easy way for people to find or to list their items that they are willing to offer to others, whether it’s a straight swap or for barter or for sale, from goods to services. Their online exchange is claimed to be secure and safe for users, allowing individuals to reap the benefits of the sharing economy, either to save money on goods or to earn it from the items or skills they already have. 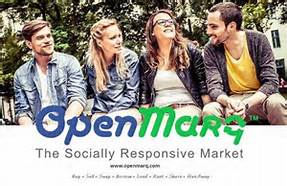 “Open Marq takes a streamlined approach to the “buy-sell-swap” model through clean, easy, and forever free searches and posting, followed by direct communication between parties. Open Marq leverages the benefits that a Collaborative Economy provides, while protecting user safety and privacy to enable users to interchange items and services they need efficiently and effectively. The platform is completely free to use, and while the current focus is on users based in the US, is completely accessible to international users. Find out more about how Open Marq can help move the sharing economy forward.